It seems like this year is just flying by. All kinds of wonderful things have been happening lately, including winning two First Place awards at the SC State Fair for handspun yarn. More about that in an upcoming post! What I’m focusing on right now is getting back into the world of street fairs and art shows with my jewelry work. It’s been a long time! I’m taking part in the upcoming Pecan Festival in Florence, SC, sharing a booth with other members of my fiber guild. I have put together a list of items I want to have ready to sell, and I’ve been busy at my bench. One of these days I’ll put together a gallery page, or at the very least, I’ll do another post with more pictures of other items. 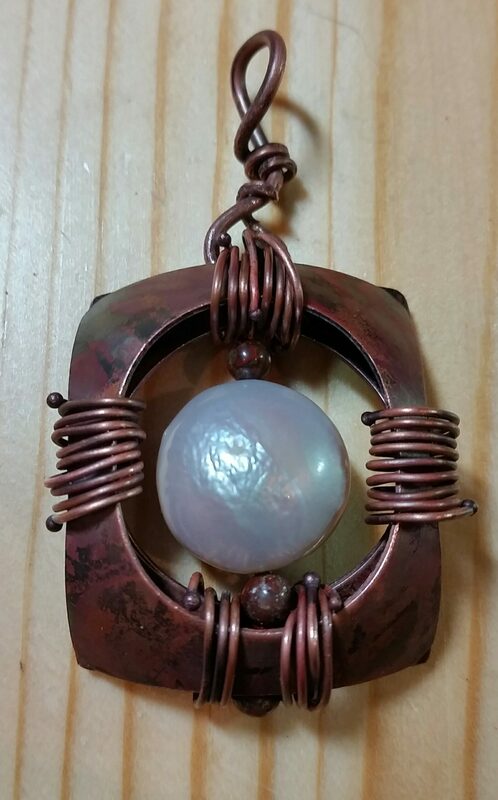 Today I completed this pendant made with torched copper, Mother of Pearl, and poppy jasper. There were some different kinds of challenges getting it together! I had to reflect on the things – tools and supplies and skills – that made it possible, and feel grateful for them all. Including a disk cutter set, dapping block, draw plate for wire, 4mm poppy jasper beads, and a bead reamer to make them fit on the drawn-down wire. And the experience and patience to keep breathing and keep trying until I got it the way I want it. 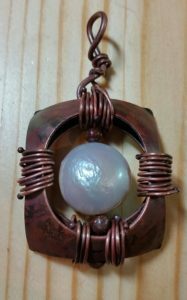 This entry was posted in Art, Metal and tagged Copper, Jewelry, Pendants. Bookmark the permalink.